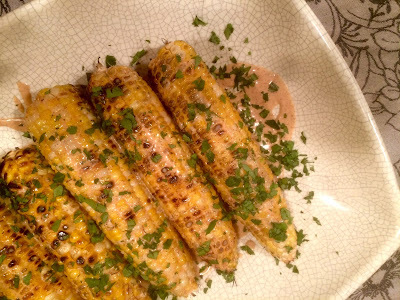 It’s a grillin’ weekend and these charred corn on the cobs with chili and lime will compliment anything you’re putting on the grill. Mix together a small container of crème fraiche with the juice of half a lime, a teaspoon of chipotle or ancho chile powder, and a quarter teaspoon of kosher salt. It’s best if you prepare this at least an hour or two ahead of time for maximum flavor then chill. After husking six to eight corns rub with a little bit of olive oil and kosher salt and grill over high heat until they’re charred evenly on all sides. It would also work with boiled corn but of course it wouldn’t be as good. To serve simply douse the hot corn with the chipotle mixture and top with a handful of chopped cilantro. Double dipping is encouraged. Summer has begun!